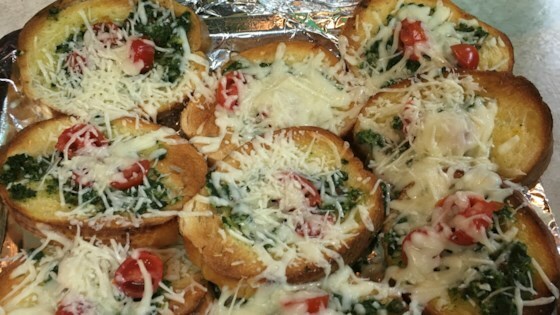 "This Italian appetizer made of bread, fresh spinach, and some other goodies is great for serving at parties. A French baguette is a long, narrow loaf of French bread. I like to garnish the bruschetta with more basil." Preheat oven to 425 degrees F (220 degrees C). Arrange the bread slices on a non-stick cookie sheet. In an electric blender or food processor combine the spinach, Parmesan, almonds, basil, garlic, salt and pepper. Blend until a paste forms. Pulse in 2 tablespoons olive oil; continue pulsing until the mixture is the consistency of soft butter. In a small mixing bowl combine chopped tomatoes, green onion and 1 tablespoon olive oil; stir. Bake the bread slices for 5 minutes or until crisp and brown. Arrange toast on a serving platter. Spread each piece of toast with a thin layer of the blended pesto, then top with the tomato mixture. Tastes Great and a hit at the last party I went to, but the spread was messy to make (especially without a food processor). Wonderful recipe. I made mine in the blender this time but I believe it will be easier in the food processor (a little "gummy" to begin in the blender). Definitely will make again!!! This was a great hit at the bridal shower I took it to. Quick and easy to make.